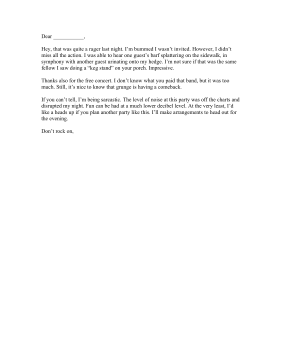 Sarcastic and biting, this angry complaint letter warns a neighbor that their party the night prior was too loud and disruptive. Hey, that was quite a rager last night. I'm bummed I wasn't invited. However, I didn't miss all the action. I was able to hear one guest's barf splattering on the sidewalk, in symphony with another guest urinating onto my hedge. I'm not sure if that was the same fellow I saw doing a "keg stand" on your porch. Impressive. Thanks also for the free concert. I don't know what you paid that band, but it was too much. Still, it's nice to know that grunge is having a comeback. If you can't tell, I'm being sarcastic. The level of noise at this party was off the charts and disrupted my night. Fun can be had at a much lower decibel level. At the very least, I'd like a heads up if you plan another party like this. I'll make arrangements to head out for the evening.